WELCOME TO GLAMIS DUNES STORAGE! 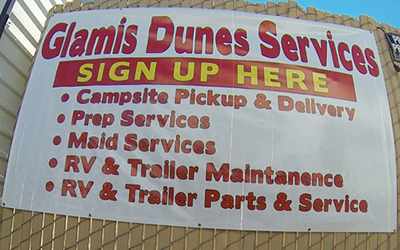 Glamis Dunes Storage is a full service facility. We are the only storage facility located in the heart of Glamis Dunes directly across from the Glamis Beach Store. Our location offers quick and easy access to and from the dunes and all the amenities of the vendor row. GDS makes it easy and effortless to come and enjoy the dunes. With the hard hitting fuel prices of today, why haul your RV’s and toy boxes back and forth when you can have them safely awaiting your arrival. Our lighted facility has 24 hour access with keypad coded entry, asphalt (not dirt) and designated spaces to accommodate any size. We also have drinkable water (not well water) propane, dump stations, gasoline and friendly faces to welcome you. We consider the Glamis community a family and we would like to help you save your time and gas. We are here to answer any questions you may have. We hope to hear from you or see you soon and always remember to be safe on the dunes! For questions or information please call (760) 351-1301 or send us an email at info@glamisdunesstorage.com. We are happy to help! We have a large unit selection ranging from 30’space, 40’space, 70’back in, 70′ pull thru, 40′ container and much more.